Member organisations of the Environmental Paper Network are working together globally to eliminate paper products from deforestation, irresponsible practices, and social conflict in the critically threatened tropical rainforests of Indonesia and to support local communities in developing alternatives. December 2017 Webcast: Update from Indonesia and launch of framework for auditing progress of APP/APRIL on policy implementation. Performance Milestones for Asia Pulp and Paper: A resource for assessing APP as a responsible supplier and its sufficient implementation of civil society’s call for reform. The Indonesian forests are the homes of communities of indigenous and other peoples whose livelihoods depend on forest resources. They are rich in biodiversity…Indonesia’s archipelago contains a great portion of the world’s plant and animal species – including 10 percent of the world’s flowering plant species, 12 percent of all mammal species, 15 percent of all reptiles and amphibian species, and 17 percent of all bird species. The lush rain forests on the Indonesian island of Sumatra are the only place in the world where elephants, tigers, rhinos and orangutans coexist. This diversity includes some of the world’s most endangered species including orangutans, Sumatran tigers, Sumatran rhinoceroses and Asian elephants, and more than 1,500 species of birds and thousands of plant species. Scientific expeditions in parts of Indonesia regularly uncover animals never before seen. In November 2017, the discovery of a new species of great ape from Sumatra was announced, the Tapanuli orangutan. Many of the remaining rainforests grow on deep peat soils, which release massive amounts of carbon when laid bare by logging, used for intensive tree production, and at high risk for fire. The destruction of Indonesia’s forests and conversion to pulp plantations (along with palm oil plantations) has been a social, environmental and climate disaster and working together to stop it is a critical EPN priority. But these exceptional forests suffer from what may be the world’s fastest deforestation rate, threatening the survival of those species and causing massive carbon emissions. More than 6 million hectares of natural forest were lost from 2002-2012. 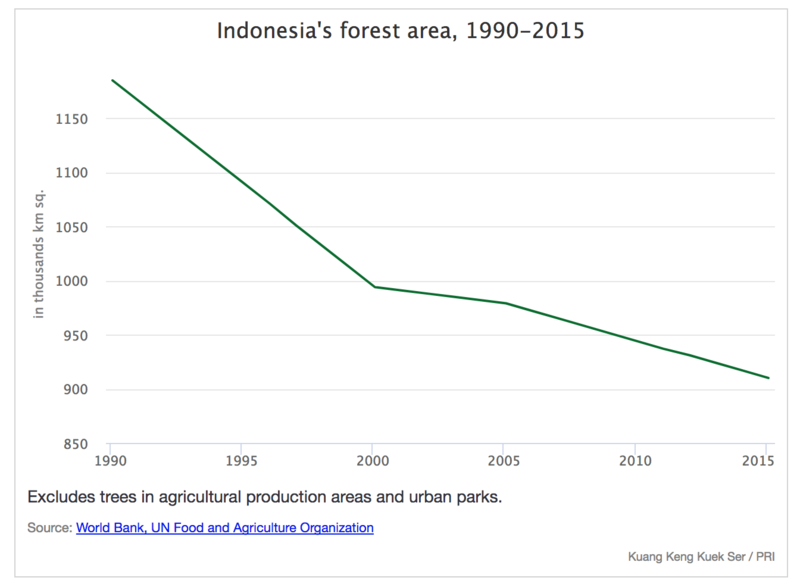 Since 1985, Sumatra has lost more than half of its forest cover, leaving less than 13 million hectares. With only about 400 Sumatran tigers and fewer than 2,800 Sumatran elephants left in the wild, this last remaining habitat is critical to the survival of these species. The pulp and paper and palm oil industries account for the vast majority of deforestation in Sumatra. Pulp and paper linked to massive deforestation represents exactly the opposite of the values and the solutions identified in the Global Paper Vision, and the tropical forests of Indonesia have been ground zero. Therefore, the EPN has been actively educating a global audience and bringing together stakeholders for marketplace driven solutions since 2008. EPN is coordinating a global effort of the conservation community to prioritize collective action, promote and support grassroots actions, distribute information globally to stakeholders, and build strong working relationship among conservation leaders and organisations with a common goal. In 2008, EPN was a host of a pivotal Roundtable at the headquarters of Random House Publishing in New York City on the links between pulp and paper production, the marketplace and deforestation and social conflict in Indonesia. Over influential 100 business leaders attended, along with leading international and Indonesian conservation experts and the largest paper companies in Indonesia. Following the event, and the continued education efforts of EPN member organisations, concern in the marketplace began to grow and actions followed. The European EPN (now EPN-International) also decided to engage in a global campaign to stop the expansion of products from irresponsible producers into European markets, until the industry stopped natural forest conversion and to adequately addressed conflicts and disputes with local communities impacted by their practices. Launching the campaign, 40 European NGOs from Italy, France, Germany, United Kingdom, Spain, Austria, Belgium, The Netherlands, Portugal, Malta, Finland, Sweden and Switzerland co-signed a letter to the paper industry demanding a stop to any purchase of paper from deforestation in Indonesia and adoption of a responsible paper procurement policy. Under the pressure from the facts and the publicity of links to their brands by member organisations of the EPN, many companies stopped buying paper coming from deforestation in Indonesia, with the cancellation of more than 100 business contracts. Companies that have announced discontinued or avoided sourcing from APP since 2000 include Adidas, Disney, Fuji, Gucci, Hasbro, Kraft, Lego, Levis, Marks & Spencer, Mattel, Nestlé, Office Depot, Scholastic, Tesco, Tiffany & Co., United Stationers, Unilever, Volkswagen, Wal-Mart, Woolworths, and Xerox. In early 2013, the major paper producer in the area, Asia Pulp and Paper (APP), announced a new forest conservation policy. Learn more…. EPN led joint work among NGOs to produce a number of milestones that this company needs to meet before being acceptable to customers again. As a result of these milestones, APP filled most of the gaps in its policy with new commitments: in April 2014, APP expanded its commitment to include the protection or restoration of a million hectares of Indonesian rainforest. In February 2015 APP announced a new implementation plan to address issues raised by an independent evaluation. Actions were announced in August 2015 by APP on the development of peatland management standards, high-tech LIDAR mapping of peatland, and removal and restoration projects on 7,000 hectares of plantations. In June 2015, the second largest pulp and paper producers in Indonesia, Asia Pacific Resources International, Ltd (APRIL) also committed to immediately stop deforestation, to protect peatlands and to address its social conflicts. Learn more…. Both companies remain high risk suppliers for responsible financiers and purchasers. International and Indonesian civil society organisations indicate that APRIL continues to be a highly problematic source. Their concerns with APRIL’s disastrous impacts on the forest, biodiversity, climate, community and human rights are summarized in this APRIL profile, as well as a database of subsidiaries and affiliated companies for use by purchasers implementing paper sourcing environmental policies.